Like so many other nutrition topics, the pendulum has swung back and forth on the benefits of Omega 3s and fish oil, particularly from supplement sources. For this post, I want to do a comprehensive overview on natural fish sources and supplements to help you gain a better understanding of this complex topic which is clouded by so many conflicting studies, most of which are poorly designed. Is fish from any source acceptable? What about Omega 3 sources for vegans and vegetarians? How much fish or fish oil supplementation is safe and healthy? What about recommendations for kids? I'm going to start off with some basic cell membrane science first since that will set the foundation for you to understand why Omega-3s are so critical for optimal health. I have a lot of readers who are doctors, scientists, engineers or just love technical details so this should satisfy their appetite. If you're not willing to get into the scientific details, then please scroll down to read about some of the more practical information and especially to the end where the dietitian from my clinical team, Prerna Uppal, shares practical strategies for individuals (including vegetarians) to get more Omega 3s in their diet. 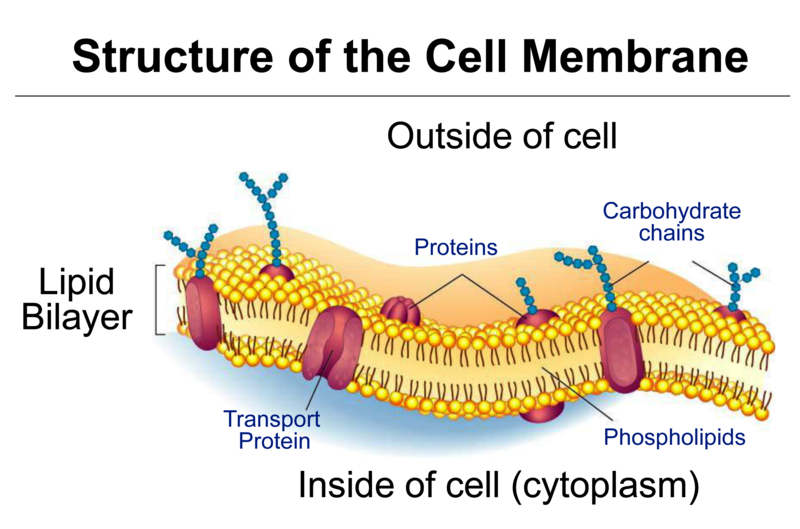 Every cell in the human body is enveloped in a structure called the cell membrane. Think of it as the skin layer of your cells. I cannot overemphasize how important the health and integrity of your cell membrane is. Biologist Bruce Lipton famously states that the nucleus is not the brain of the cell. The nucleus only controls cell reproduction, so it is the cell's gonad (reproductive organ). The real brain of the human cell is the cell membrane. Cell membranes have embedded protein switches (aka “receptors”) that sense and interact with the environment and then send signals deep within the cell to carry out specific commands. The image below nicely illustrates how the protein structures like the transporter are embedded within the lipid (fat) bilayer of the cell membrane. The cell membrane is literally like a sandwich made out of two slices of fat (instead of bread) and protein in between, which sticks out on both ends of the cell. For example, a healthy muscle cell membrane is essential for controlling your blood sugar levels. The muscle cell membrane has an embedded insulin receptor (our transport protein in above image) that interacts with the insulin hormone when blood glucose levels are high. See the image below which illustrates how 2 key cell membrane proteins (insulin receptor and Glut4) help regulate your blood glucose. 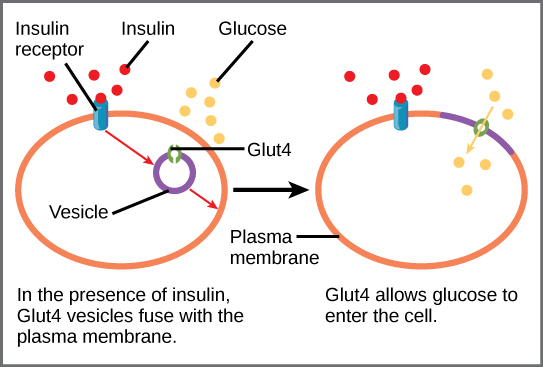 When the insulin hormone (like a key) attaches to the insulin receptor on the cell membrane (like a lock), another protein called Glut-4 floats from the inside of the cell to the cell membrane surface. Glut-4 is a channel that allows the excess glucose in your blood to enter inside the muscle cell so it can burn it for energy. If your cell membrane is not structurally intact, insulin won't properly dock onto the insulin receptor and Glut 4 may not migrate to the cell membrane surface to allow glucose inside the cell. Many of my prediabetic and diabetic patients are not able to fully control their blood glucose until their cell membranes regain optimal structure and function. Eating fewer and fewer carbs and exercising harder and harder won't remodel damaged cell membranes, meaning your blood glucose and/or Hemoglobin A1C test may remain out of range. You can apply the above model to your brain cells or any cell in your body which all require healthy membranes to function properly. Depression, cancer, Alzheimer's disease and most chronic health conditions often have unhealthy cell membranes as one of their root causes. How Are Omega-3s Tied to Cell Membrane Health? Optimal cell membrane structure and function is dependent on the balance or ratio of Omega-6 fats (let's call them O6s) and Omega-3 fats (let's call them O3s) within your cell membrane, the O6/O3 ratio. A direct determinant of the O6/O3 ratio in your cell membranes is the O6/O3 ratio in your diet. Linoleic Acid (LA) is an O6 found in whole foods like poultry, vegetables, nuts and seeds, so in moderation can be a healthy part of the diet. However O6s coming from industrialized seed-based oils (soybean, cottonseed, corn, safflower, etc.) found in most packaged foods, dressings, sauces and restaurant foods actually trigger increased inflammation, while O3-rich foods are anti-inflammatory. My dietitian Prerna will discuss these foods in detail at the end. During evolution, the O6/O3 ratio was about 1:1, meaning our earliest ancestors ate roughly equal parts O6 and O3, which contributed to healthy cell membranes and the absence of most of our modern day health problems. Our ratios today are now closer to 20:1, meaning we are eating 20 times more O6 fats than O3s, producing cell membranes which are highly susceptible to oxidation, inflammation and severe damage. Such a high O6/O3 ratio has been linked to multiple chronic health conditions like obesity, heart disease, cancer, diabetes, Alzheimer's disease and depression to name just a few. Ideally the ratio of O6/O3 in our diet should be closer to 3:1 and Prerna will tell you how to achieve this ratio at the end of the post. The most biologically active and anti-inflammatory O3s are DHA and EPA which come from marine sources like fish and algae. Fish actually get their DHA and EPA from eating algae, which are at the base of the fish food chain. ALA (Alpha Linolenic Acid) is an O3 present in plant foods and can be converted to DHA or EPA but studies have traditionally reported very poor conversion rates (<1-5% conversion) of ALA to DHA and EPA. This is often discouraging news to vegetarians and vegans trying to get sufficient DHA and EPA in their diet. However, some studies like this one make a compelling case that the conversion rates are not truly this low since after ALA is converted to DHA, much of it gets stored in our tissues which is why measured rates in the blood are so low. Animal studies also show that ALA-fed rats still have sufficient DHA in their brain and there is no evidence to show that healthy vegetarians and vegans have higher rates of neurological diseases which suggests that they may be converting ALA to sufficient amounts of DHA and EPA. Interestingly there also seems to be genetic variations in how well we convert plant-based ALA to DHA and EPA. For example, a significant percent of Asian Indians have a genetic mutation as shown in this study showing that vegetarian Indians evolved to produce a genetic adaptation to allow more efficient conversion of ALA to DHA and EPA. African Americans also had a relatively high frequency for this mutation, while Europeans and East Asians had a lower incidence. So for my fellow South Asians who are often discouraged by my reports of maladaptive genes that make us more prone to diabetes and heart disease, here is finally a mutation that actually works in our favor! The most widely studied benefits of Omega 3s are for heart disease. Observational studies in patients with established coronary heart disease (CHD) indicate that modest fish oil consumption (~250 mg EPA+DHA) may reduce the risk of sudden cardiac death. Evidence also seems to suggest that getting some O3s is better than none, but higher consumption does not appear to further reduce the risk of death from heart disease. Most experts recommend that healthy adults should get at least 2 servings of fish a week and if they absolutely can't eat fish, then taking O3 in supplement form is a reasonable option. A single capsule of most standard fish oil supplements should get you the potentially heart-healthy 250-300 mg of EPA+DHA (more on supplements in a moment). It is best to eat high quality, well sourced fish like wild salmon to reduce mercury and other pollutants. Pregnant women and children should avoid high mercury fish like shark, swordfish and mackerel which are larger predatory fish. The Seafood Watch Website run by Monterey Bay Aquarium has excellent information on safer seafood recommendations. 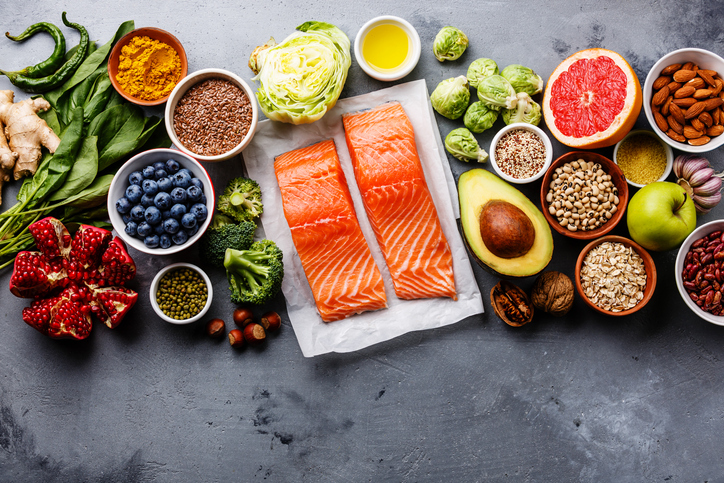 Other conditions where Omega 3s have potentially beneficial therapeutic effects include anxiety/depression, brain health (including during pregnancy and fetal brain development), inflammation and autoimmune disorders, metabolic syndrome and more. More extensive studies need to be done to further strengthen Omega 3 effectiveness in various health conditions. 3. DO O3 SUPPLEMENTS REALLY WORK? As mentioned, we would prefer you get most of your O3 fats through natural foods which my dietitian Prerna discusses at the end. O3s in fish are wrapped in protein and micronutrients that make it more biologically active and available than taking it in pill form. In my clinical experience and those of my colleagues who recommend O3 supplements for a variety of inflammatory disorders, we have had mixed results. Enough positive results to consider using in appropriate patients, but not overwhelmingly positive results where we recommend it to all patients or give confident reassurances that fish oil capsules are the answer to all their problems. In terms of scientific studies that report on the ineffectiveness of O3 supplements, keep in mind that many of them used an inadequate dosage of O3s, rely on recall questionnaires to determine how often individuals actually take the supplement (a highly inaccurate method), and often the supplement is taken for too short of a duration. Some of the headline grabbing studies from 2014 which criticized fish oil supplements, led by researcher Brian Peskin, were actually retracted as shown here after discovering his competing interests. I've discussed in the past how poor most studies are that try to evaluate nutrition and nutritional supplement efficacy. Also keep in mind that if you are just adding Omega 3s to a diet that's full of O6s and deficient in natural O3s, you will likely experience no benefit. Inflammation is like a forest fire in your body and just taking a couple of O3 capsules every now and then in the midst of an unhealthy diet and lifestyle is like throwing a few handfuls of water on an inferno. For your cell membranes to actually remodel, you need to implement a diet low in O6s, add natural O3s and supplement with high quality fish oil capsules for a minimum period of 6-9 months which is how long it takes to make substantial renovations to your damaged cell membranes. I think this is the other reason so many studies showed O3s as being ineffective. The studies are done mostly in individuals who are eating an O6 rich unhealthy diet and leading an inflammatory lifestyle. As mentioned already, choose fish from the best sources you can find. This is becoming increasingly challenging due to overfishing resulting in contaminated and crowded fish farms. An increasing concentration of toxins and pollutants are being found in our fish supply. If future studies confirm that plant-based ALA is a sufficient source for O3s and is as effective as fish-based O3s in lowering disease risk, then we will have to seriously reconsider how we obtain our O3s. For O3 supplements, the most well known risk has been bleeding and it used to be common practice to stop O3 supplements before surgery. However, more recent studies have found that this is not the case and in fact O3 supplements may reduce the risk of bleeding after surgery as shown in this 2018 study. The most important risk with O3 supplements is the quality of the supplement. Healthy oils can be healing and anti-inflammatory, while poor quality or rancid oils can do the exact opposite by increasing oxidation and cell membrane damage. If you want to rebuild healthy cell membranes, you need to use high quality materials. Some guidelines for choosing the right O3 supplements are covered next. I'll provide a few guidelines for choosing the right O3 supplement but at this time I can't share recommended brands. The reason for that is because I've noticed changes in quality control for different manufacturers over the years. Get the right dose of DHA/EPA: The front of the bottle may say “1 gram fish oil” but you must look at the ingredients on the back of the bottle which may say 250 or 300 mg of DHA/EPA. That may be the right dose for heart protection, but you may need a greater dose for other conditions mentioned above, like 2-3 grams daily of DHA/EPA. Talk to your doctor to determine the right dose. Online Review Sites: Beware that some of these review sites are sponsored by fish oil manufacturers who conveniently rank their product at the top of the list. I use consumerlab.com (minor subscription fee required) and labdoor.com is another reasonable ranking site as well. These companies independently vet various supplements. Certified Brands: If the supplement is labeled with a seal from NSF International, USP (US Pharmacopeia), IFOS (International Fish Oil Standards), Underwriters Laboratory or Consumer Labs, it ensures a higher quality product. There may still be high quality products without these seals, but at least the seals can help guide you. It is worth doing more in depth research to find a high quality brand. Overfishing is a major worldwide problem and environmental contaminants like heavy metals (mercury. lead, arsenic, cadmium), PCBs and others can get concentrated inside your fish oil capsules and possibly lead to long-term toxicity. Krill oil is turning out to be a very popular alternative to fish oil and is derived from tiny crustaceans commonly eaten by whales, penguins and other sea animals. Krill provides DHA/EPA and some studies suggest it is more bioavailable and better used by the body. 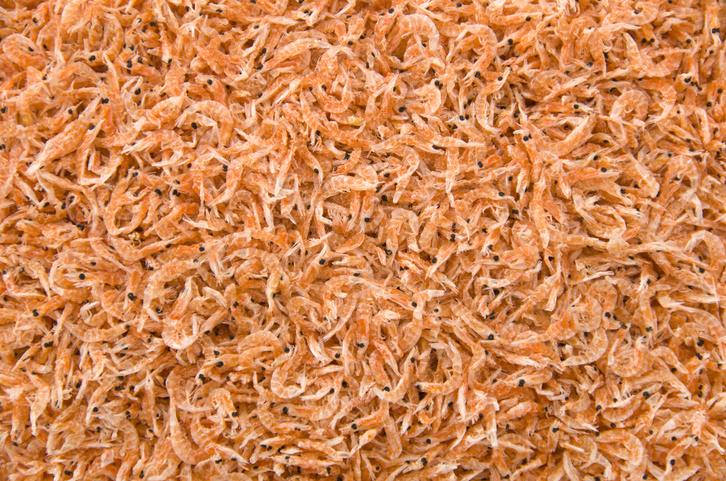 Krill capsules are also smaller and sourcing is more sustainable with less damage to the environment. Preliminary studies seem to indicate cholesterol lowering and anti-inflammatory actions, but we will need further studies before we consider it an equivalent of superior alternative. In terms of vegetarian/vegan options for supplementation, algal oil is a popular alternative since it is a direct source of the DHA/EPA that fish get from their diet. Downsides are increased price, lack of anti-inflammatory Omega 7s found in fish oil, and lack of long-term studies on effectiveness compared to fish oil. An abnormal ratio of O6/O3 is especially critical to a child's brain development and may potentially manifest as a mood disorder (depression, anxiety, etc. ), attention disorder, or possibly spectrum disorder, since each of these conditions is being increasingly tied to some degree of inflammation in the brain. My wife, pediatrician Dr.Shally Sinha, has seen children have significant improvements in mood and behavior with dietary changes. Although we typically attribute this to the reduction of sugar in the diet, it's also important to understand the significance of optimizing O6/O3 ratios. Unfortunately the children's cereal, snack, and portable lunch industry is loaded with foods containing abundant inflammatory O6s. Just like adults, we want to focus on a food first strategy toward improving ratios consistent with Prerna's recommendations below. In some circumstances using an O3 supplement may be a reasonable option. Be sure to discuss with your doctor and as mentioned already, do choose a high quality product. The IFOS link here does provide some overall age-adjusted recommendations for O3s in different age groups. Now that you understand the importance of cell membrane health and optimizing O6:O3 ratios, let's discuss some practical ways of improving your ratio through food. We are both convinced that when our patients follow our nutrition and lifestyle advice and experience improvements in concentration, memory, energy and mood, much of that is attributed to a healthy remodeling of their cell membranes as O6s are lowered and O3s are increased. Watch those Oils: Avoiding processed seed and refined vegetable oils as well as fried foods and processed foods that have been cooked in these vegetable oils i.e. sunflower, corn, soybean and cottonseed oil. Read labels of all packaged foods and you'll be surprised at how most of them contain O6 fats. Restaurant Foods: Most restaurants will use O6 oils for cooking and often reuse them which makes them even more toxic and inflammatory. You can ask the waiter what type of oil they use or choose dishes that are less likely to be saturated with O6 oil. For example, most Indian and Asian restaurants will soak their curry and stir-fry sauces with O6 oils. You are better off eating the drier meats and vegetables. Avoid or limit grain-fed animal products, since these animals are fed O6-rich corn and soy which end up in their meat, dairy and eggs. Do remember that omega-6 fats are essential in small quantities, however, source them from unprocessed nuts such as walnuts, almonds and cashews. Omega-3 enriched eggs or pastured eggs. Our tips on picking eggs are here. If you are taking supplements, remember to take them with food and try not to take large doses at one time. Split up the dose for optimum absorption. Full fat, organic, grass fed milk- 8 oz. Combine all the ingredients in a cup. (Can be had warm or cold, based on your preference).